In our case, the next stop was the goal we had been pushing hard towards since we left CT on January 3rd. Our journey to date was a time of discovering how to live in the Airstream, but the major goal was to get to the Fort Pierce/Stuart area where Jim’s mother, Betty, has a condo. Betty is 95 and in amazing shape given her age. Always a beautiful and petite woman, she still has her looks and her mind is kept sharp by doing myriad crossword puzzles daily. She can buzz through the NY Times Sunday puzzle in under an hour. While Betty usually lives in Michigan, she has had this condo in Stuart for decades. To give her the opportunity to enjoy the Florida warmth, three of her children were taking turns staying with her. Jim’s brother, Phil, and his wife, Renee, were first up. We would do our turn and then his sister, Linda, would come down for the final leg of the visit and the eventual return to northern climes. 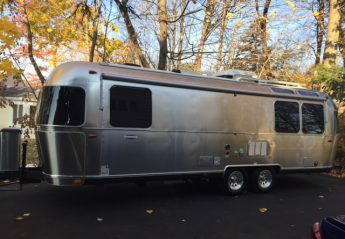 The wrinkle in this plan for us was, of course, the Airstream. We couldn’t very well hunker down in the parking lot at Betty’s condo. Actually, there was a further complication. Many years ago Jim’s father, Jack, as head of the condo board, had passed a rule that pickup trucks couldn’t overnight in the parking lot. Ironically, we couldn’t even park Big Blue there. So, Dakota, the Airstream and I took up residence at the Road Runner Travel Resort and Jim headed forty minutes south in a rental car to stay with his mom in Stuart. Southern Florida is so crazy crowded with rv’s, that was the closest decent spot we could find. The Road Runner Travel Resort was a bit of a shock at first. Having spent more than a week in state parks, we needed to adjust to the closer living quarters of a rv resort. RV resorts have a different ethos and clientele than a state park. More on that at a later time. After checking in at the office, we headed to our camp site. Road Runner is a pretty large park—more than 400 sites. The streets all feature president’s names so we took a left on Madison. When we pulled up to our site, I got out to spot and the lady at the site next door said, “you need to come from the other direction to back in.” Oh, okay. I was willing to follow her direction and duly reported this to Jim in the cockpit. He grumbled, “who does she think she is…” I pointed out she undoubtedly knew far more than we did and he headed off to re-orient. When he got back, our new neighbor, Carol, and her husband were both on their feet and ready to help. Rick offered to back us in and we took him up on the first of many kind offers. Rick is a retired truck driver and he had our Airstream perfectly positioned in a minute and made it look incredibly easy to do so. Jim was thrilled and relieved. Backing in with a large audience is never stress-free and he learned some valuable tips in the bargain. People in rv parks are generally incredibly friendly and very willing to help—I found this out frequently over the next ten days. I would point out two other characteristics of Road Runner and Florida rv parks in general. The first is that you very rarely see Airstreams. We are definitely a bit of an oddity. This is true in state parks as well. It will be fascinating to see if this is less true when we get west of the Mississippi. But in Florida the Class A and Fifth Wheels rule. The second observation I would make is that half of Canada is down here. There must be no one left at home in Quebec. The common areas at Road Runner rang with the sound of Canadian French. I don’t blame them because it is really cold up there, but those left behind must be feeling a bit lonely. Actually, Rick told me that last year there were far more Canadians at Road Runner. The strength of the dollar thinned the migration quite a bit this year. With Jim located to the south by forty minutes, Dakota and I took to life on our own. This was actually a very good development as it forced me to take charge of Airstream care and conquer my fear of lighting the grill and any number of other things. Midway through the week there was a big storm scare. I had to take in the awnings and prep for high winds and this was all good to learn. Again, Rick and Carol were very helpful with advice. They made it clear they were there to help me if I needed it and it was very comforting to know that. Over the course of the week, we developed a pattern. One day Dakota and I would do something on our own like go hiking and the next day we would drive down to visit Jim and Betty. This ended up working out quite well for all involved. Thank you, Arlene. I appreciate your kind words and I am glad you are along for the journey! I really like your blog and lalways ook forward to the next edition! I had spent a couple of times in St Augustine to go flying and I do like Florida. Here in Austria is still deep winter and I can imagine you must be glad to escape the cold parts of the US! What a great country you live in ( does not need to become great again!)! We hope you enjoy your adventures as much as we are. Glad ya’ll are becoming more comfortable with life on the road in the Airstream. Having your Airstream must be like dating a super-model since it is – by far – the classiest and most beautiful of anything else you’d find in a state- or rv-park. Well put! She is so sleek and gorgeous and IMO the rv’s are big, bulky hulks. I love your analogy!